Andreas Petsas & Sons Ltd a pioneer in the Cyprus car hire business since 1962 . 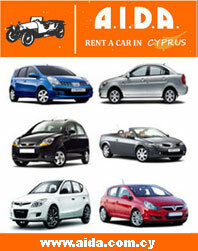 We are one of the largest car hire companies in Cyprus with a fleet of over 1000 cars on the road, offers a wide choice of quality cars ranging from Economy to Luxury, Saloon or Cabrio, manual or automatic, with or without Air Conditioning and four seater soft top jeeps 4 x 4 to eight seater hard top jeeps 4 x 4 at competitive rates. The company maintains car hire offices in all towns and holiday resorts of the free territory of the island and undertakes delivery and collection of cars at the customers convenient point, anywhere, anytime, 7 days a week. With the reliance of more than 50 years of presence in the Cyprus car rental market, the company aims at continued modernisation and offer of vehicles and services for a far-fetching and economically competitive service to customers. Taxis, Chauffeur Driven Limousines, Mini Buses and Coaches, all fully air conditioned are also available on request.